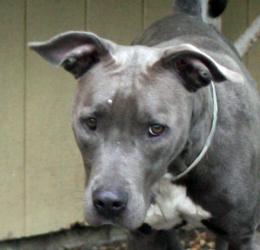 This month’s “Touch of Pit” features the little ears of sweet, little Kiara. 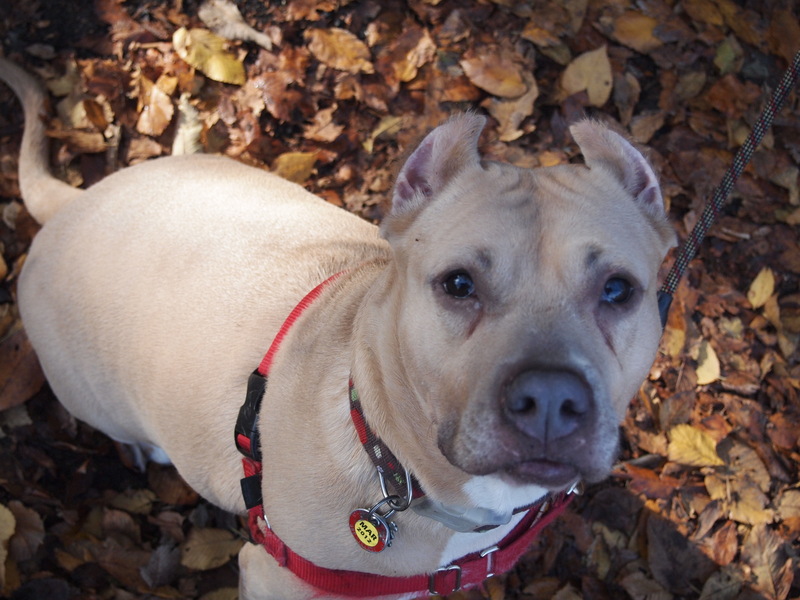 We met Kiara during a series of free training classes offered by The Bully Project in Ft. Tryon Park, here in Manhattan. Kiara’s owners were very new to dog ownership and training, and we were so thrilled to see them there, especially when Kiara was so young. We knew that they would get a great head start on becoming a breed ambassador team. 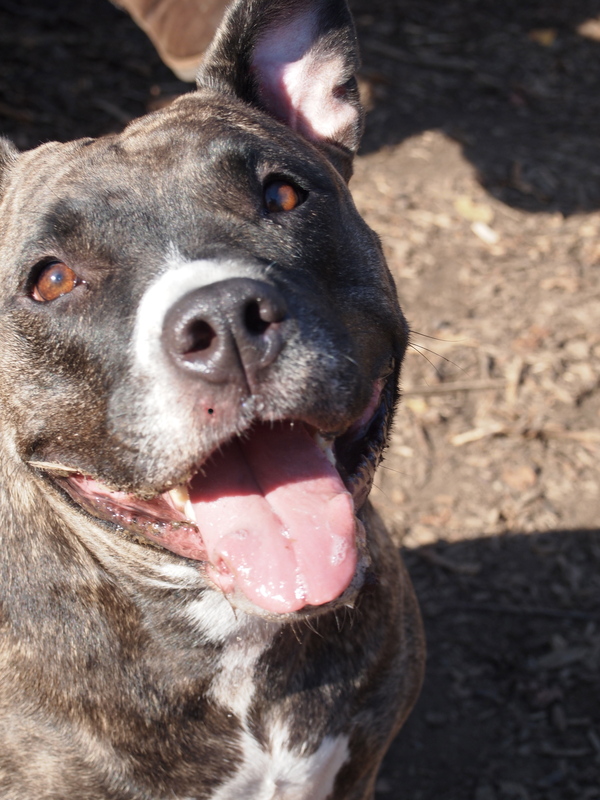 We’re so proud to know Kiara and know that she’s going to become a great positive force in pit bull awareness – showing people how wonderful our dogs can be! Thank you very much to all of our readers and donors who helped contribute to My Boy Bill’s fundraiser over the past two weeks. Up until this point, we have raised $880 to help cover the costs of Bill’s extensive medical treatment. We would now like to announce the winners of our fundraising raffle. For a refresher course on our prizes, click here. Our winners will also be contacted via email with instructions on how to claim your prizes. Again, thank you very much for your generosity. And just because our raffle is over does not mean our fundraiser is! 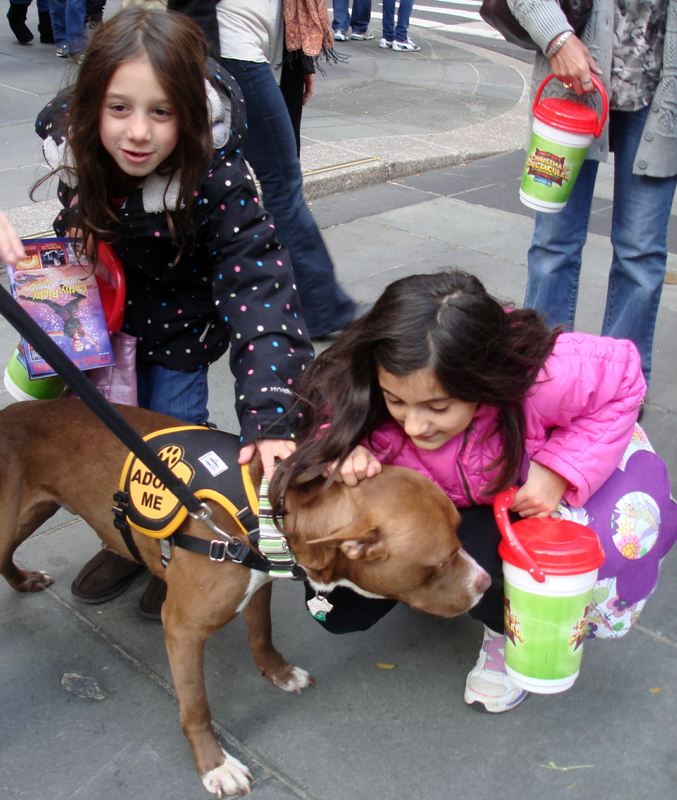 You can continue to support Animal Haven by visiting our fundraising page on their website! And Bill says, “Thank you,” too! 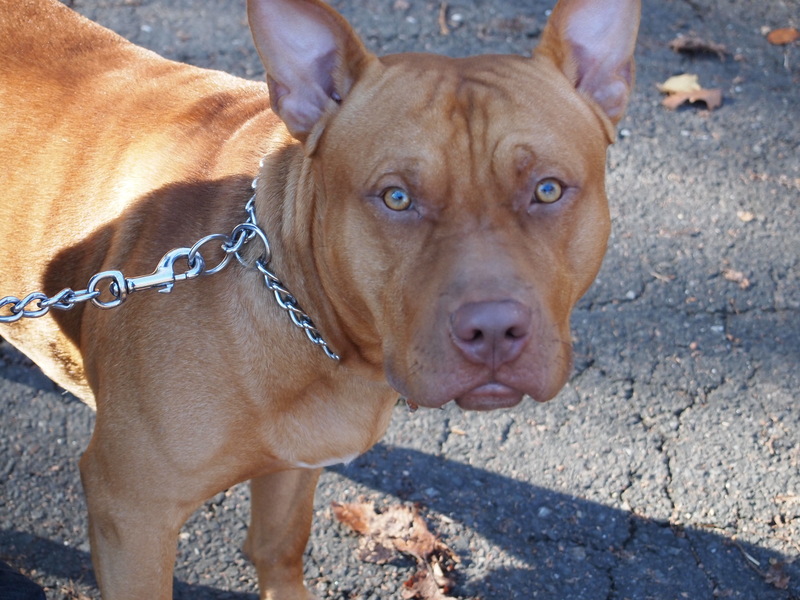 For this week’s adoptable, we head back to Animal Haven, and bring you Bowser! 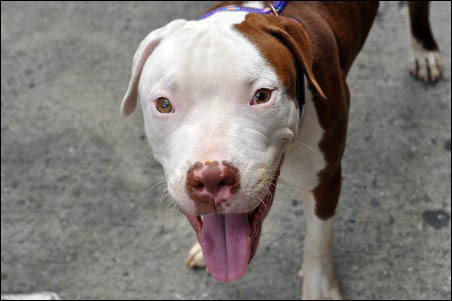 If you, or anyone you know, is interested in giving Bowser a loving forever home, please call Animal Haven at (212) 274-8511. Since it’s Thanksgiving week, we want to continue on the theme of giving thanks and being grateful. 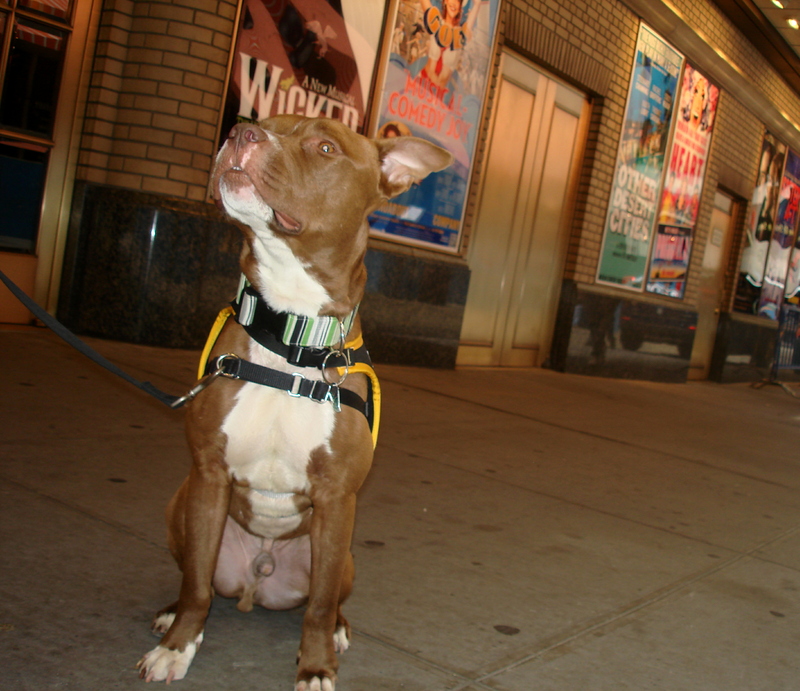 We mentioned Penelope, the blue nose pittie that attended the NYC Pit Bull Meetup, but we didn’t share why she is such a lucky girl. Almost a year ago, she was just a nameless abandoned dog. One of thousands in NYC each year. 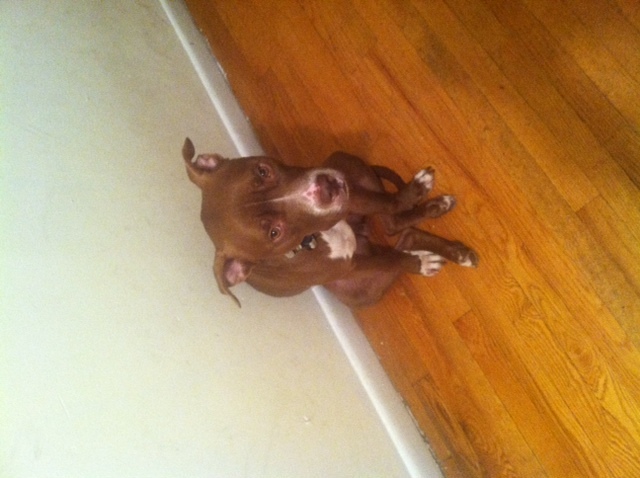 But this lucky girl was tied to the Williamsburg Bridge during a snow storm, and was picked up by a good Samaritan. This nameless dog quickly became an Internet news star. The finder used his site to share her story. She must have come by our email boxes hundreds of times – everyone was forwarding her story. 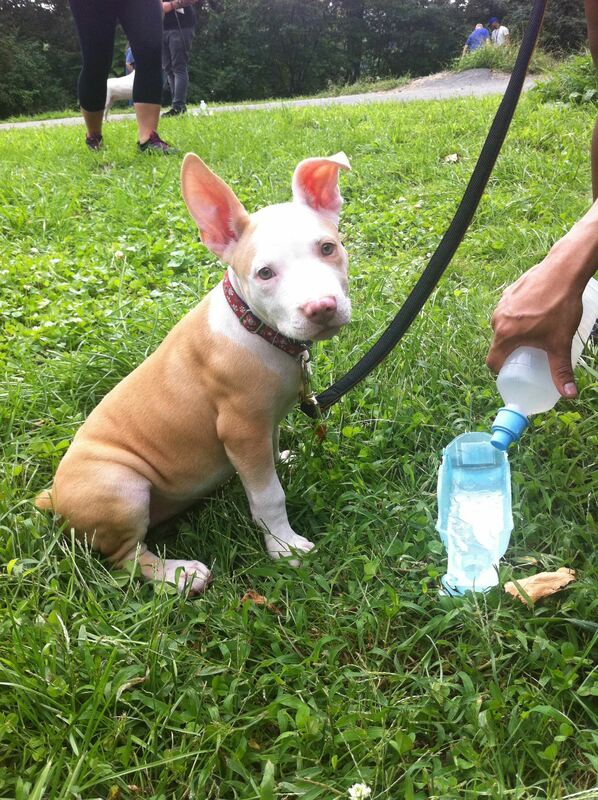 Even our blogger Josh inquired about adopting this girl! She found a home within days! How often does that happen for a pittie-like dog? 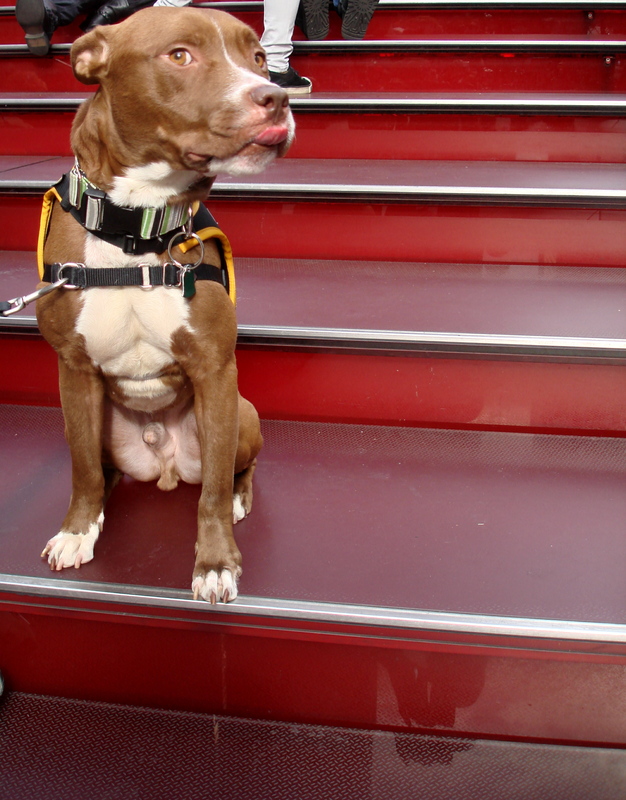 Little did we know, this lucky pittie was adopted by a great couple and a pair of pugs – that we’re acquaintances with from the Ft. Tryon dog park. Now this pretty girl splits her time between NYC and DC and is not looking back. We are so thrilled this story had a happy ending – and that we get to witness it! 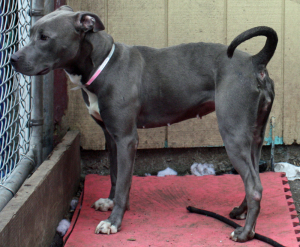 But, it makes us wonder…why did thousands of people want this dog and not the hundreds of pittie-like dogs in the tri-state area shelters right now? When looking at dogs like Herbie or Phyllis at Animal Haven, we ask ourselves: if they were considered bait dogs or tied to a bridge in a storm, would they have a line of potential adopters on Centre Street? Are dogs with less dramatic stories not as desirable? Isn’t being at a shelter (no-kill or not) dramatic enough? This is another whole blog post on its own for the future…but it certainly is food for thought. Some more pics of Penelope to start your weekend. .. I can’t wait to eat some turkey! Turkey! Daddy never gives me people food, but I think if I snuggle up to him enough, and show him how thankful I am that he’s mine, he just might give me some noms. I’ll let you know what happens. Two weeks ago, Dad and I set a goal for ourselves: get My Boy Bill adopted by Thanksgiving. Well, we didn’t do it. Sad face. My Boy Bill is still living with us (and if I am being honest, I’m pretty thankful for that)! Bill and I have become pretty good buddies. We like to lay cuddled up together with Dad, and share our toys. We even share our deer antlers – I get it for a little while, then I give it to Bill, and then he gives it back! But what we’re really grateful for is your support in helping Animal Haven rebuild their Recovery Road Fund. 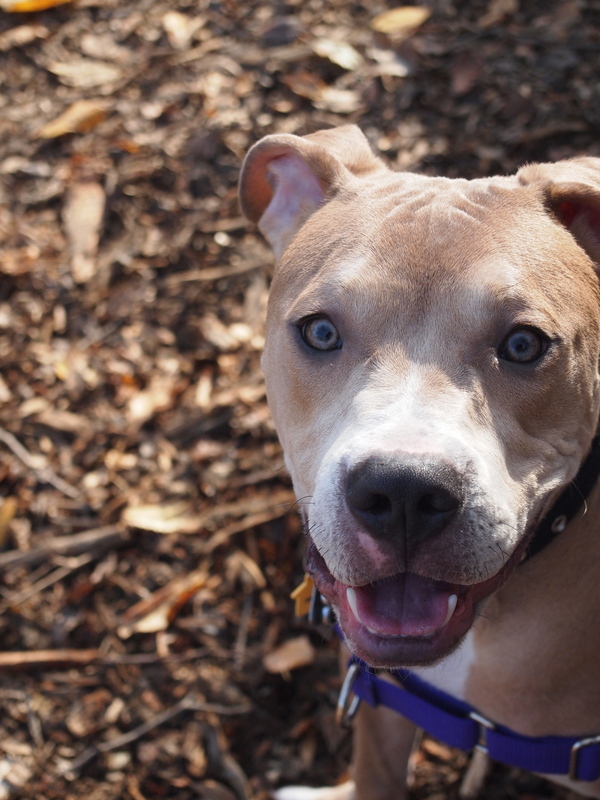 They spent a lot of money making My Boy Bill feel better, and now with the help of our generous donors, they can help another animal (hopefully another deserving pittie!) feel better, too. But you can still donate! And enter our raffle! We’d be eternally thankful if you did! 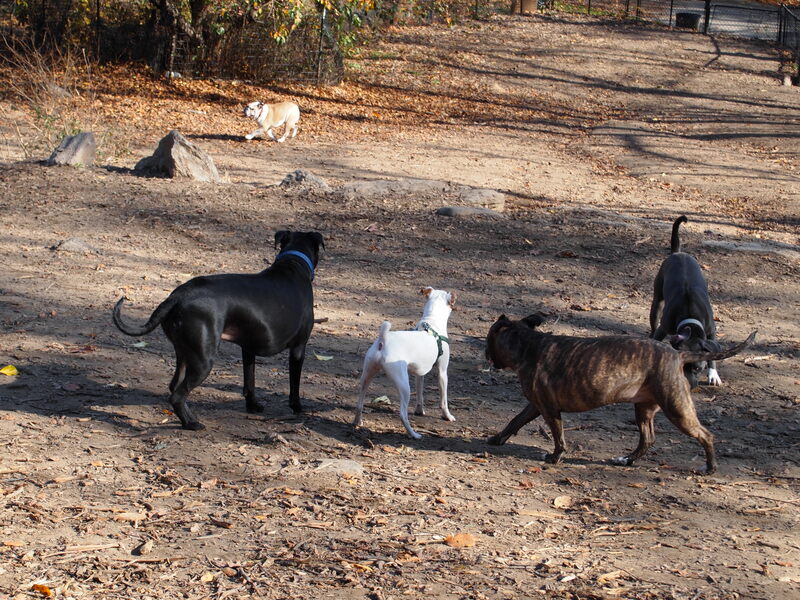 This past weekend, I was lucky enough to be at my local dog park when members of the NYC Pit Bull Meet-Up arrived for a scheduled trip. I have been a member of the meet-up for a long time, but more as a lurker. 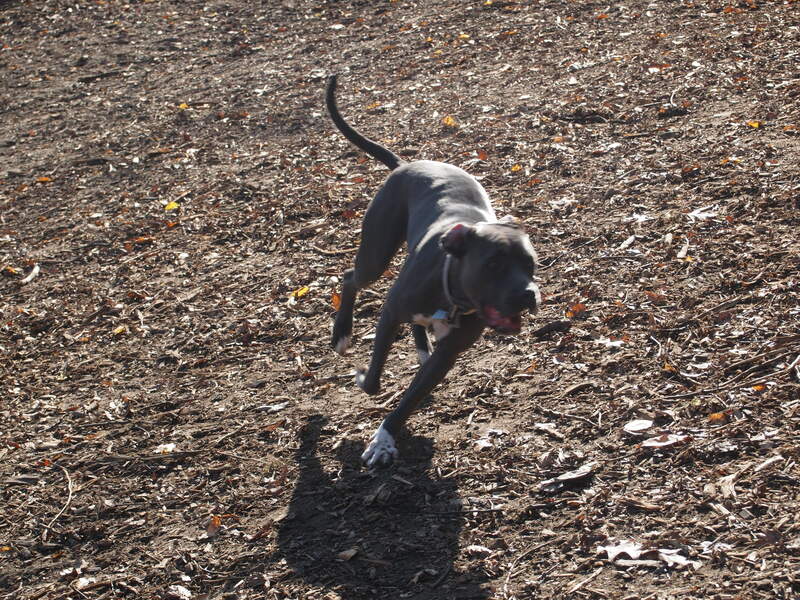 The group organizes trips in the tri-state area for off-leash play, organized walks in the city and share their thoughts in a discussion group. 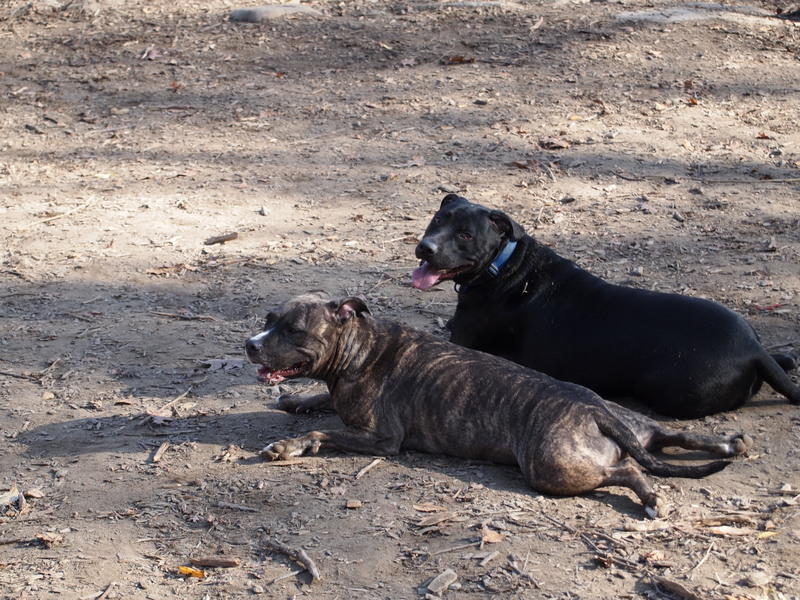 I have enjoyed the discussion group and I think that it is so helpful to have this platform for new and old pittie owners. 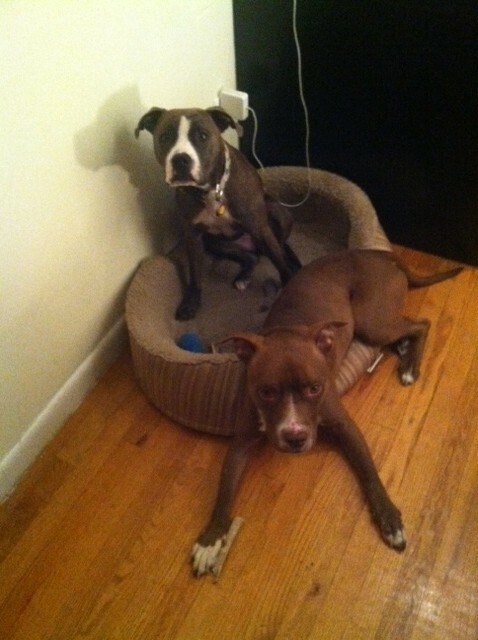 They often share stories, resources and alert each other of pitties in need. 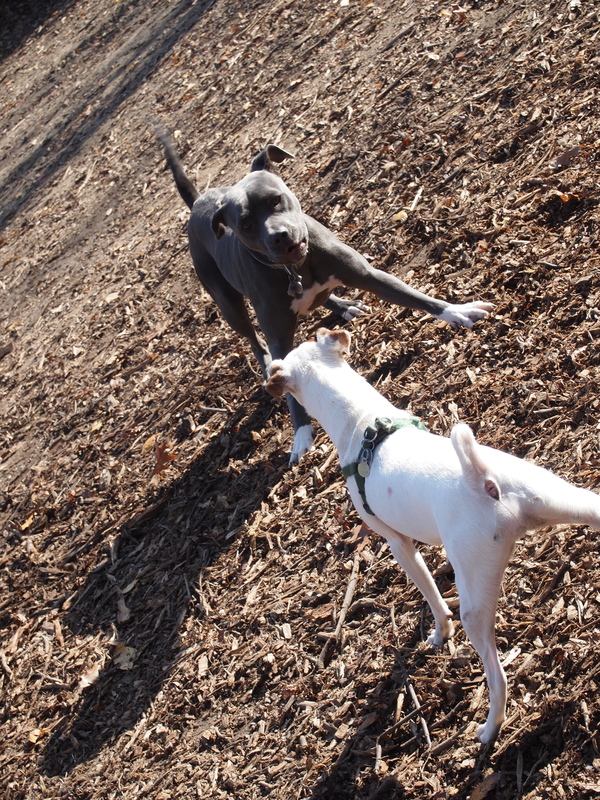 I must say, as a regular visitor to my dog park, I was concerned when someone mentioned there was a PB Meetup scheduled. Yes, I admit it, my hackles were up – I am always concerned when a group of dogs whether it be a meet-up or a doggy daycare visit the run. 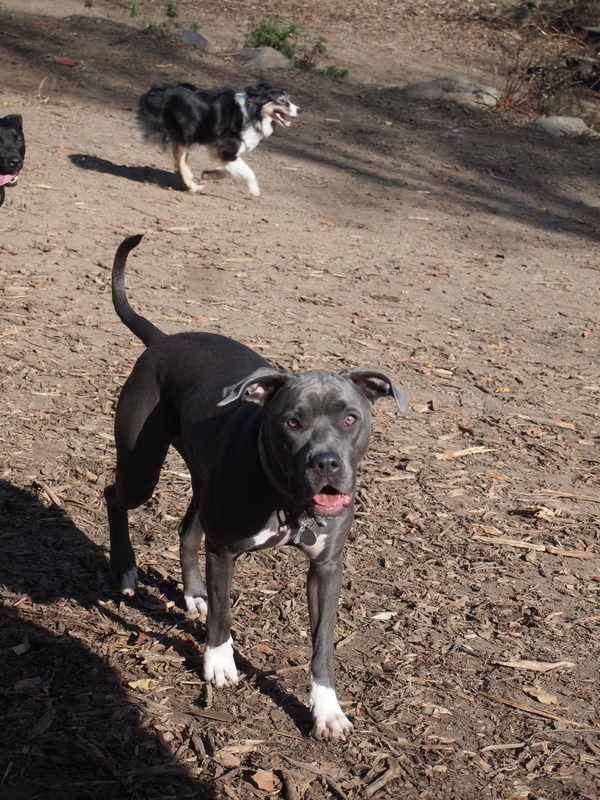 These are dogs that are typically not regulars and, if all arrive at once, can easily change the vibe of the dog park. And, if you visit dog runs regularly, you also know that some people bring dogs that are not appropriate for multiple dog play in an off-leash environment. And, this was a Saturday at 11 am, which is like happy hour for dogs. 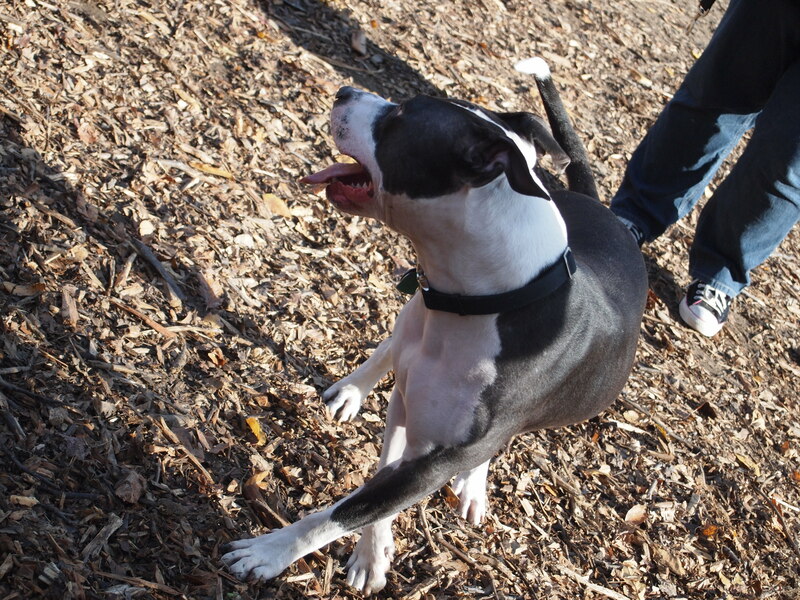 While we are talking about dog parks, I personally think it is pretty rare that an adult dog – of any breed – likes/should go to/wants to go to dog parks. When we bring our dogs to runs, we expect so much from them: be social with all dogs, share your toys with strangers, and be a good dog always! Now just replace “dogs” and “a run” with “people” and “a bar.” Get it? Mostly, runs are for the young adolescents who have boundless energy and are usually super social. 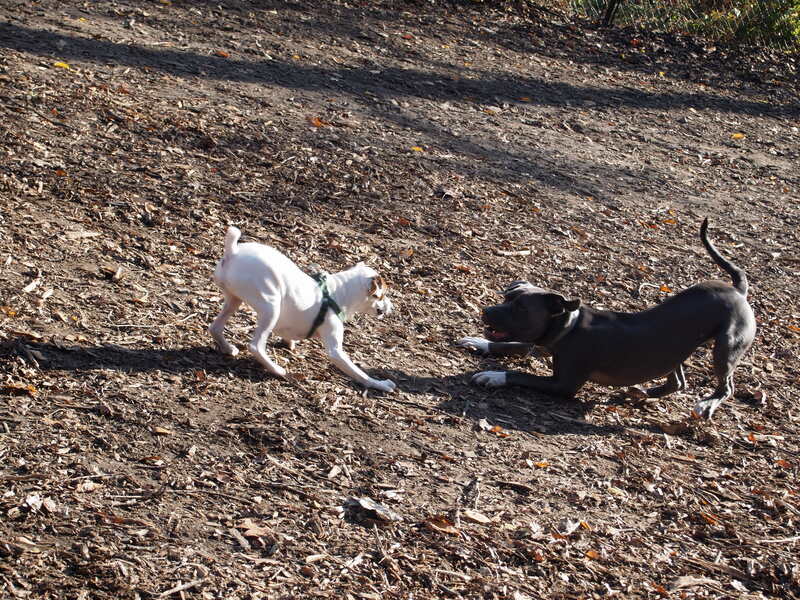 I am lucky that my dog park is huge by NYC standards. Unlike most urban runs, dogs are forced to socialize in small spaces. I think, like always, that owners need to be responsible with their dogs wherever they go – and set them up to succeed. More info on dog parks from Dr. Sophia Yin. 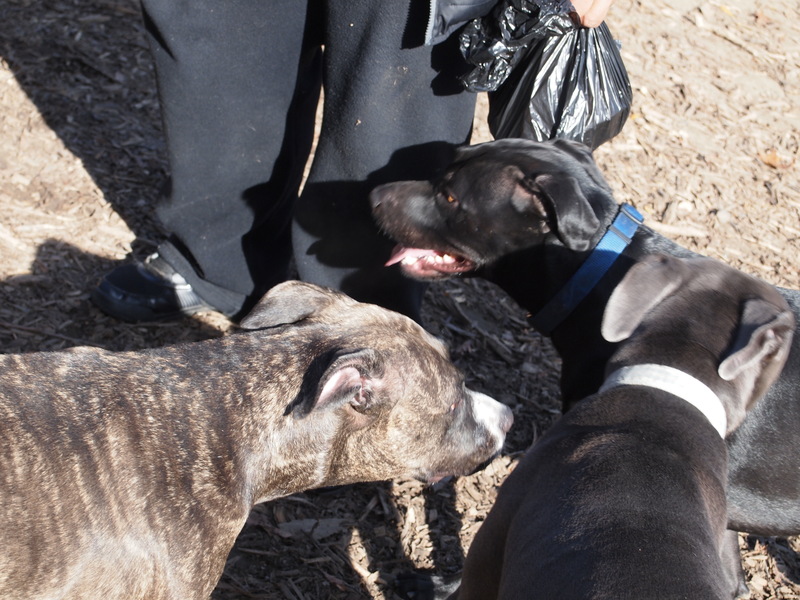 The most lovely, local pitties and their owners showed up at Ft. Tryon Dog Run. First there was Marley who I actually met the day before when he and his owner visited the park. 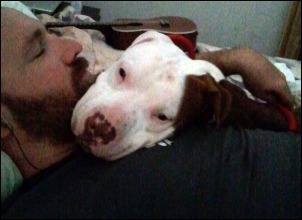 His dad took in Marley when the original owner could no longer take care of him. She was over 65 and already had a yorkie, birds and an iguana. And, yes, Marley is named after the yellow lab in Marley and Me! Next we met John and Ella, and their family, which included a mom, dad and a new baby in a bjorn. Such great owners. 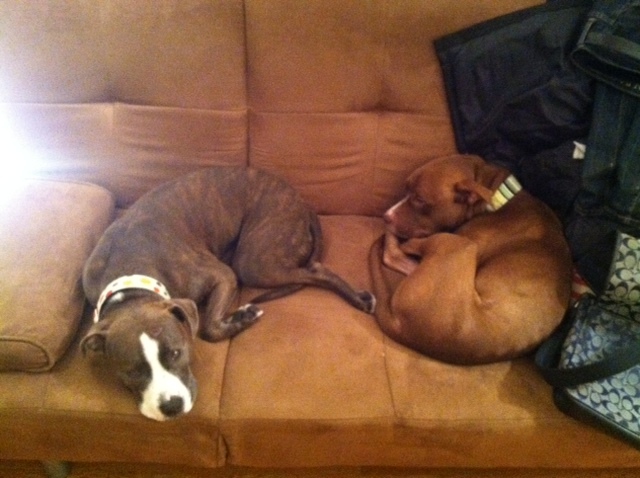 They realize that Ella, an almost Elderbull, cannot handle dog parks any longer. So, she watched from outside with her mom and two-legged baby sister in a sweet sweater. 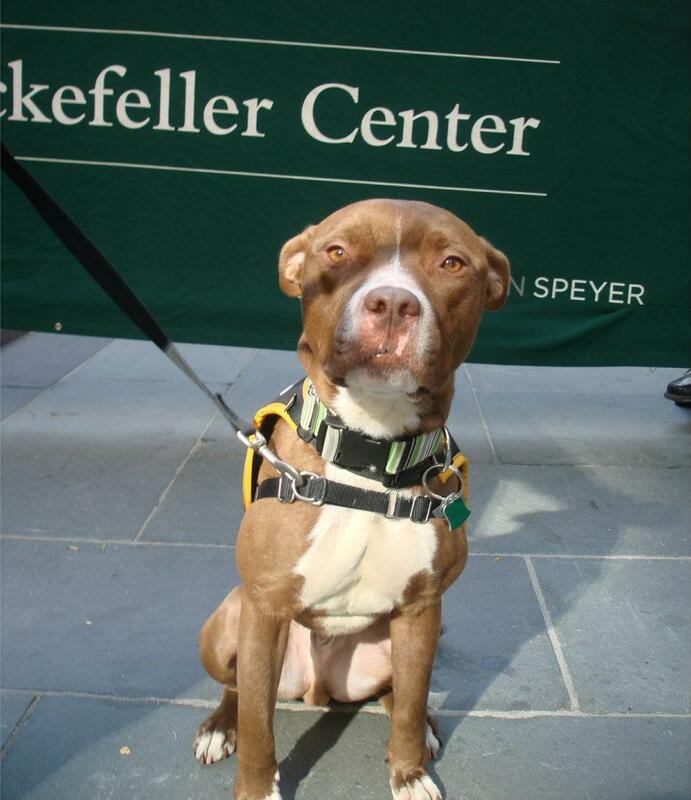 Ella was adopted from the ASPCA a few years ago and is a trained therapy dog. 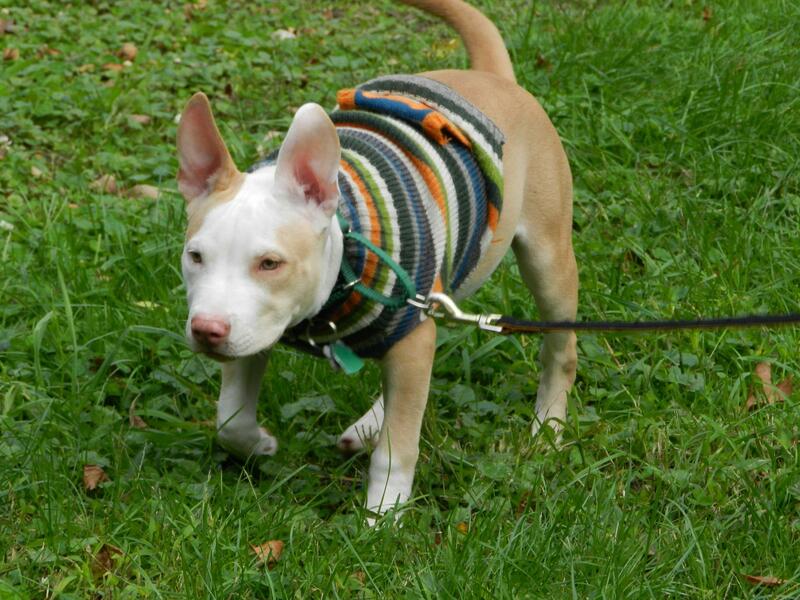 John, on the other hand, is a super active, athletic young boy who LOVES dogs and can be a little shy with new people. I am always impressed when new baby parents don’t forget that their first four-legged children need their own activities and special time, too. 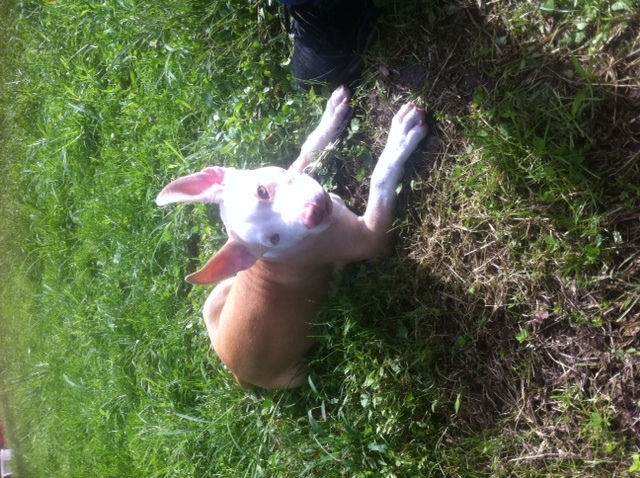 John and Ella also brought along Prince, an lovely adolescent pup with the most gorgeous eyes! It is all the family – Prince and his family live in the same building as John and Ella. And, Prince’s mom is the nanny for John and Ella’s human sibling! And, lastly, there was Penelope: the life of the party. 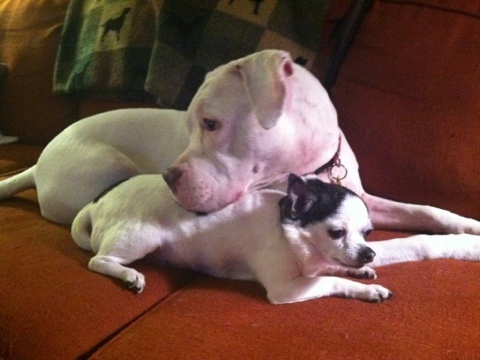 She played with large dogs, little dogs…She loves everyone and shares her home with two pugs. There will be more about Penelope in a later blog…she is a celebrity of sorts. I am so happy that the PB meetup went so well on Saturday. I hope they organize another one in my park soon. I will always remain diligent about making sure I am responsible with my dogs, and will still be on guard when large groups come around – but this meetup showed me that when a group of other responsible dog owners come to the run that I can be more confident that everyone will have a good time. And now, I have more pitties to stalk! 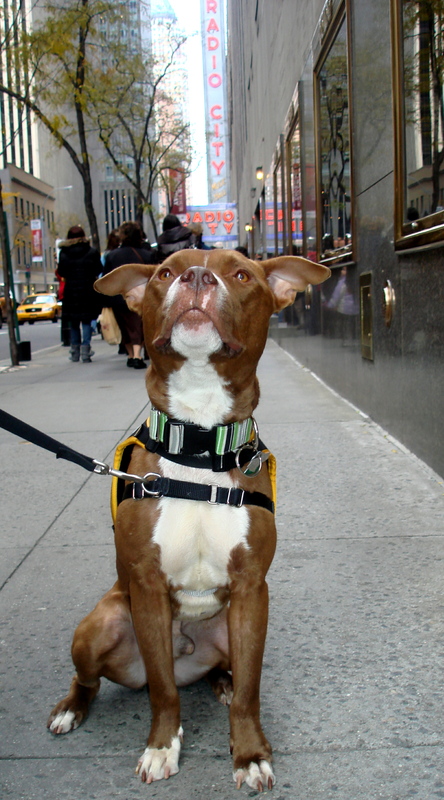 Why not visit Meetup.com and look for a pittie club near you? There are currently 62 meetups listed on the site. 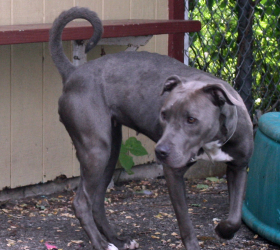 This week’s adoptable comes from the Yonkers, NY Animal Shelter! 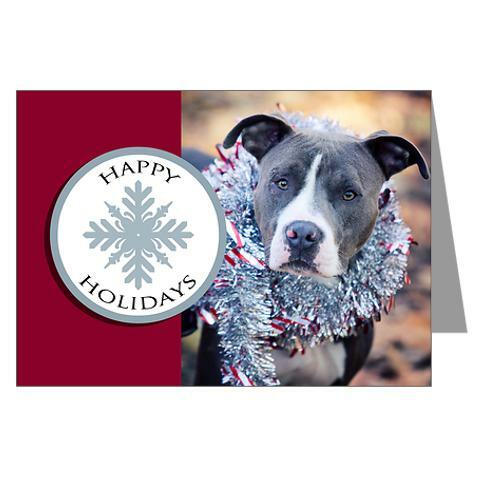 Our friends at StubbyDog hooked up with Melody McFarland of Melody Pet Photography and created these fabulous pittie holiday cards! All of the dogs on the cards are available for adoption. What a great way to share adoptable dogs! 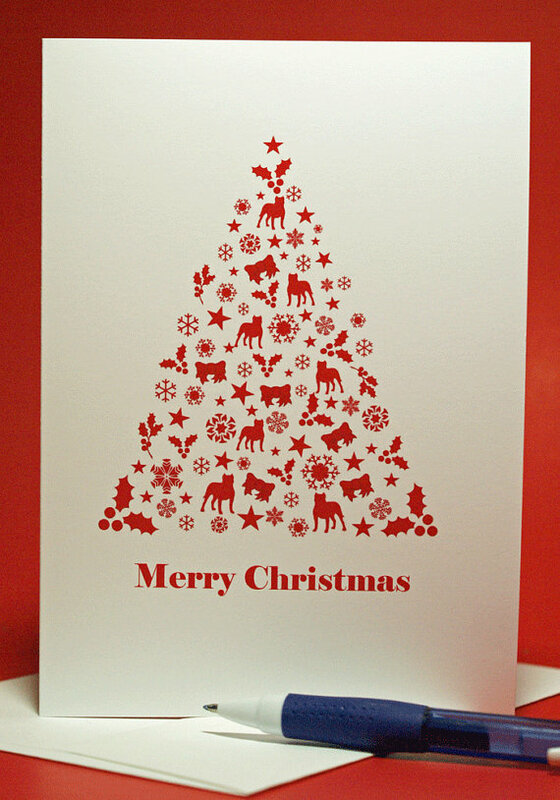 And, while browsing Etsy we found this lovely card at Love at First Bark’s Store. So delicate, yet subtly shows the breed we love so much! And, lastly, if you are looking for any art for yourself or for gifts, make sure to visit Stubby’s Art Auction. You will find everything from Pet Portrait sessions to jewelry to collars and dog toys. 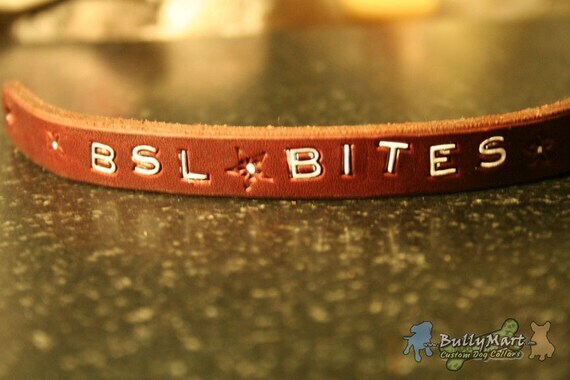 Bid away because this is guilt-free shopping – all the proceeds go to help Stubby’s misson of improving the lives of pit bull type dogs. This past weekend, I took My Boy Bill out for a long walk around town. He wanted to see some of the big sights in the city before the flood of tourists starting arriving this weekend. We checked out Rockefeller Center, Radio City Music Hall, Times Square, some Broadway theaters & Shubert Alley. 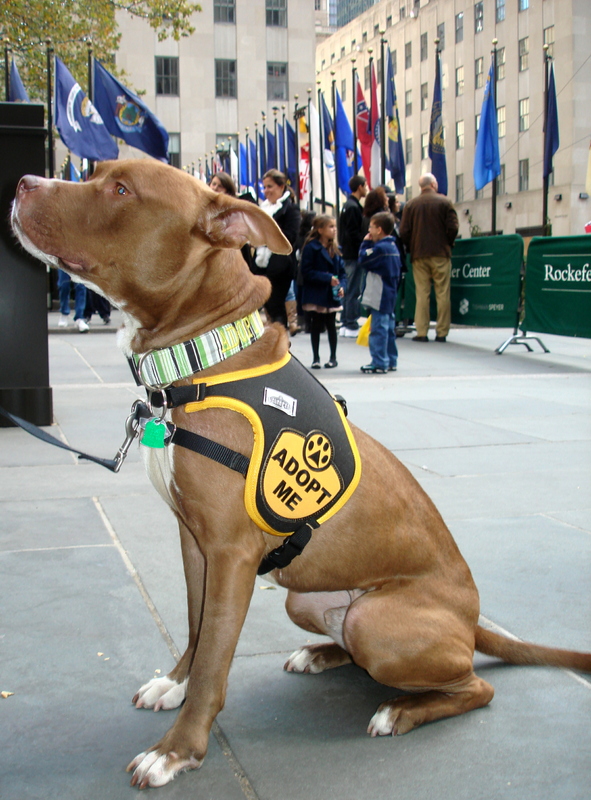 Bill wore his Houndgear “Adopt Me” vest, which got him lots of attention! We also visited some friends and met some folks who may or may not be interested in adopting My Boy Bill! Here are some photos of our little jaunt! Special thanks to my friend Stephen Mosher, for taking and providing the photographs. Stephen is not only a wonderful photographer, but also a fitness guru and one of the subjects of the new documentary film, Married and Counting. I even make an appearance in that film, too! Foster Dad's Fave New Pic of Me! 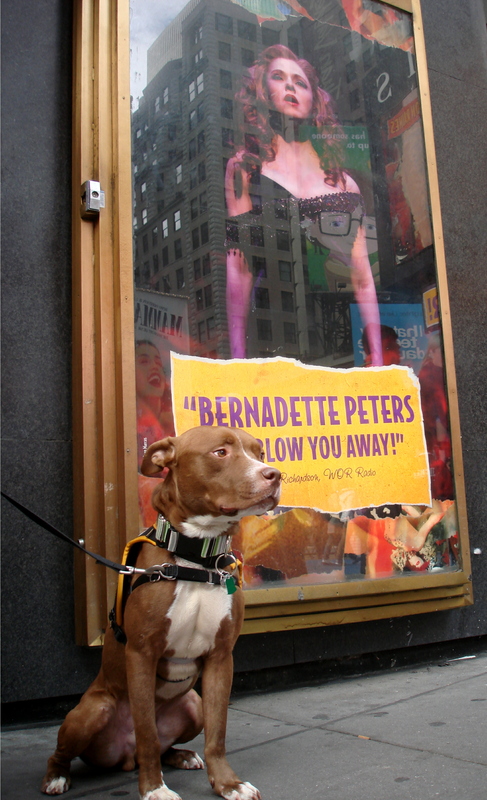 With my friend, Bernadette Peters! So, as you can see, we had a great day! And don’t forget about our fundraiser! We’ve set a goal of $1000 for ourselves, and have until Thanksgiving to raise it! And guess what?! We’re almost there! But we still need more – so check out the story of Bill’s medical woes, read up on our fundraiser raffle, and donate!